The University of Southern Mississippi (USM), known informally as Southern Miss, is a public research university with its main campus located in Hattiesburg, Mississippi. The Hattiesburg campus is located 70 miles (110 km) north of Gulfport, Mississippi and 105 miles (169 km) northeast of New Orleans, Louisiana. USM is accredited by the Commission on Colleges of the Southern Association of Colleges and Schools (SACS) to award baccalaureate, master's, specialist, and doctoral degrees. The university is classified by the Carnegie Foundation as a "Research University" with "High Research Activity" (designation "RU/H"). Founded on March 30, 1910, the university is a dual campus institution, with the main campus located in Hattiesburg. The other large campus, Gulf Park, is located in Long Beach, with five additional teaching and research sites, including the John C. Stennis Space Center and the Gulf Coast Research Laboratory (GCRL). The university includes polymer science research center,, and a highly-ranked Fine Arts program including music, art and design, dance, and theater, its highly ranked graduate programs in education, clinical psychology, nursing, social work, speech language pathology, English, and history, and its online graduate programs in nursing and business (MBA). The university has an extensive study-abroad program to about 20 countries through its Center for International Education. Its British Studies program regularly sends more than 200 students each summer to live and study in London. Originally called the Mississippi Southerners, the Southern Miss athletic teams became the Golden Eagles in 1972. The school's colors, black and gold, were selected by a student body vote shortly after the school was founded. While mascots, names, customs, and the campus have changed, the black and gold colors have remained constant. USM offers 16 sport programs at the Division I level of the National Collegiate Athletic Association (NCAA). The University of Southern Mississippi was founded on March 30, 1910, as Mississippi Normal College, a teacher-training school. The Normal College was created to standardize the process of training upcoming teachers. Before the existence of a specialized teaching college, instructors were required to travel throughout Mississippi to prepare their students for teaching. The college's first president, Joseph Anderson Cook, presided over the opening session of instruction on September 18, 1912, and oversaw the construction of College Hall (the academic building); Forrest County Hall (men's and married students' dormitory); Hattiesburg Hall (women's dormitory); the Industrial Cottage (training laboratory for home management); and the president's home (now the Ogletree Alumni House). In its first session, Mississippi Normal College had a total enrollment of 876 students, and stood for "clean, pure, efficient lives." In 1954 the United States Supreme Court ruled in Brown v. Board of Education that segregation of public schools was unconstitutional. But when Clyde Kennard, a black Korean War veteran, attempted to enroll at Mississippi Southern College in the late 1950s, McCain made major efforts with the state political establishment and local black leaders to prevent it. Kennard was turned down three times. After he wrote letters about educational integration to the local paper, he was twice arrested on trumped-up criminal charges; he was eventually convicted and sentenced to seven years in the state prison. Dr. McCain's direct involvement in this abuse of the justice system is unclear. He was likely aware that the charges against Kennard were fraudulent, but neither he nor other public officials made any objection. At the very time McCain was working to keep Clyde Kennard out of Mississippi Southern College, McCain traveled to Chicago on a trip sponsored by the Mississippi State Sovereignty Commission. He spoke to the business community to try to attract investment to his state. To reduce any concern about news of integration, he told businessmen that the blacks who sought to desegregate Southern schools were "imports" from the North. But Kennard was a native of Hattiesburg and resident of Eatonville. By the early 1960s, national pressure was growing to integrate Mississippi's institutions of higher learning. McCain was well known to vehemently oppose having any black students at Mississippi Southern. In 1962 James Meredith attempted to enroll at the University of Mississippi, the state's flagship institution. His enrollment was accomplished after white rioting and use of National Guard troops to end the violence. As a result, black students Gwendolyn Elaine Armstrong and Raylawni Branch were enrolled without incident in September 1965. In 2018, USM unveiled a Freedom Trail Marker in honor of Clyde Kennard, in front of Kennard Washington Hall, named after him and the first African-American doctoral student to graduate from USM, Walter Washington. Shortly thereafter, at the spring commencement ceremonies in May 2018, Clyde Kennard was posthumously awarded the Doctor of Humane Letters honoris causa from USM. A student in Kennard's Sunday School class at Mary Magdalene Baptist Church in Eatonville, Mississippi, accepted the honor on his behalf. Between 1955 and 1965, USM along with its President, William D. McCain, infringed upon the civil rights of Gay and Lesbian students. Gay and Lesbian students, with an emphasis on male homosexuals, were targeted and expelled. McCain's intentions were to purge the campus of all sexual impurities. In 1969, the Afro-American Cultural Society (AACS) was founded. Alvin Williams, an early member of the organization and professor emeritus of media at the university, described AACS as an "instrumental part of student life for black students" attending the university in the late 1960s. The organization was later renamed as the African American Student Organization (AASO) in the 1990s. The transition of the 1960s to the 1970s gave way to a surge of social activism and major changes within the university. In response to growing concerns of black students, the university ramped its efforts to hire black faculty. In 1972, "General Nat" (Confederate General Nathan Bedford Forrest) was discarded in favor of the Golden Eagles. In 1974, standout football player Fred Cook was voted as the first black Mr. USM. The first black Greek organizations premiered in 1975. By the time McCain retired in 1975, enrollment had climbed to 11,000 students. The university experienced an unexpected, highly publicized drop from "Tier 3" to "Tier 4" in the U.S. News & World Report college rankings beginning in the 2004 edition. This roughly coincided with the height of the Shelby Thames controversy, when he fired tenured professors for "dissension". Several organizations scrutinized the legality of his actions, as tenure was designed to protect academic independence. In 2004, the USM Faculty Senate expressed their grievances to Thames after the allegations were heard. The Faculty Senate later published a review of the Thames Administration describing its controversies. After Thames resigned, by 2009, U.S. News & World Report again ranked the university as in the upper portion of "Tier 3.". In the 2011 U.S. News & World Report College ranking, USM was in the "Tier 2". In 2016, USM was ranked by U.S. News & World Report 125th in national public universities and 220th in national universities. USM is also ranked highly by Washington Monthly, which has criticized rankings by U.S. News & World Report and developed its own system. These rankings attempt to make a more holistic assessment of an institution's value; USM ranked 98th out of 245 doctoral institutions. This was the highest ranking of any school in Mississippi. As of 2016[update], Washington Monthly ranked USM 165th in research specifically and 192nd in national universities overall. In June 2015 Southern Miss released a statement on the removal of the Mississippi state flag from all USM campuses. Later that year on October 25, 2015, university president Rodney D. Bennett released another statement, announcing that the university would only raise flags that he felt united all students. Since the removal of the state flag, protests to bring back the flag have become common Sunday occurrence on the Hattiesburg campus. In early October 2013, the U.S. Army announced that, due to financial constraints and the low production rate of commissioned officers, 13 ROTC programs at various universities would be shut down, including the Golden Eagle Battalion of Southern Miss. The programs were to be ended by the end of the 2014–2015 spring semester, but the universities attempted to appeal the decision. On October 12, a press conference was held at USM to protest the closure; speakers included Governor Phil Bryant and Major General Augustus Collins. In early November, the Army said it had changed its plan to end programs at specified institutions, putting them on a two-year probation, with reevaluation. USM has been taken off probation and the ROTC program continues. Southern Miss offers approximately 189 programs leading to baccalaureate, master's, specialist, and doctorate degrees. Southern Miss has traditionally drawn many of its students from Mississippi schools and community colleges, hailing from every county in Mississippi, though today the majority of undergraduates come from public schools across the southern United States and around the globe. The university is accredited by the Southern Association of Colleges and Schools and its programs are accredited by 30 state and national agencies. The University of Southern Mississippi offers more than 250 clubs and organizations, as well as intramural athletics and special events. Student organizations at Southern Miss include the Student Government Association, The Legacy, The Student Printz (the biweekly student-produced newspaper), The Southerner (the yearbook), Southern Style (the university's student orientation team), national fraternities and sororities, honor societies, and various religious organizations. In addition, the school participates in the NCAA's Division I-A, and Conference USA featuring year-round athletics in 16 sports. Southern Miss also hosts, participates in, and promotes more than 300 cultural events every year. Regular events include the Jazz and Blues Festival held on the Long Beach campus, performances by the theater, dance and music departments, and exhibits presented by the art department. The university's Dale Center for the Study of War and Society hosts several lectures and programs throughout the year. Several guest lecturers including General David Petraeus (2017), Dr. Robert M. Gates (2014), and former Secretary of State Madeleine Albright (2010) visited Hattiesburg as a part of the center's Dale Distinguished Lecture Series. 2018 marked the 13th annual Richard McCarthy Lecture Series, wherein students and the community at large could participate in a broad range of events and programming from panel discussions to roundtables focusing on war and the effects it has on the societies surrounding it. The University of Southern Mississippi is governed by the University President along with the Mississippi Board of Trustees of State Institutions of Higher Learning. The President of the University of Southern Mississippi is the day-to-day administrator of Southern Miss and is appointed by and responsible to the State Institutions of Higher Learning Board. Dr. Rodney D. Bennett became the tenth president of the university in April 2013. The University of Southern Mississippi recently began an academic reorganization changing the academic structure at the University and the roles of administrators. This plan reduced the number of colleges from six to four and consolidated traditional departments into thematic schools. Aubrey K. Lucas Administration Building, the "Dome"
The All-American Rose Garden is a rose garden found near Hardy Street on the campus of the University of Southern Mississippi. The garden has a semicirular form and contains many various types of hybrid roses in 32 rose beds. It existed since 1973 and was accredited the status 'Public Rose Garden' by the All-American Rose Selection Inc. in 1975. Many biologists and botanists come from all over the world to study the roses found in the rose garden. Due to the large number of rare roses found in the rose garden, plucking out a rose is against college policy, and getting caught currently results in a fine of $500. The university has 26 Greek organizations on campus, including 14 fraternities and 12 sororities. There are 19 fraternity and sorority houses. The University of Southern Mississippi has 13 residence halls, and about 5,000 students live on campus throughout the school year. The Golden Eagles have excelled in all areas of athletics. Southern Miss has captured national titles twice in football and three times in track and field. In 2011, the Golden Eagle football team finished as the #19 team in the Associated Press (AP) College Poll. The Golden Eagle football team has also competed in twenty-four bowl games throughout the course of the program's history. It is important to note that twelve of these bowl games have resulted in a victory for the Golden Eagles. On November 13, 1982 the Golden Eagle football team upset Alabama's Crimson Tide in famed coach Bear Bryant's last home game in Tuscaloosa. M.M. Roberts Stadium is the home of the Golden Eagle football team and can hold up to 36,000 fans. The Golden Eagle baseball team are two-time Conference USA champions and have been invited to twelve regional NCAA tournaments and also a trip to the College World Series. The Golden Eagle baseball team has the #3 recruiting class in the country by Baseball America. The Southern Miss basketball team is a one-time champion of the NIT tournament. The University of Southern Mississippi is the only institution within the state, and one of a dozen universities in America, to be accredited in all four fine arts emphasis areas: art, dance, theatre and music. It operates the Southern Miss Wind Ensemble and the USM Symphony Orchestra, which has enjoyed soloists such as singers Renee Fleming and Ray Charles, cellist Yo-Yo Ma, violinist Itzhak Perlman, violinist Joshua Bell, flautist James Galway, clarinetist Anthony McGill, trumpet player Doc Severinsen, and tenor Plácido Domingo. The Southern Chorale has become nationally and internationally recognized. They recently performed at Carnegie Hall in New York City and performed at various concerts in Norway and Sweden. The Southern Miss Pride of Mississippi Marching Band has performed at such events as the inauguration of President Jimmy Carter and Macy's Thanksgiving Day Parade in New York in November 2010. The Department of Theatre and Dance has been active in the Kennedy Center/American College Theatre Festival at times recently placing first in various areas of the national competition. Several productions from USM have been selected for performance at the Region IV (Southeast) festival; two productions (Catfish Moon & The Rimers of Eldritch) have been invited to the national KC/ACTF festival at the Kennedy Center in Washington, D.C..
^ Hickman, Alma (1966). Southern As I Saw It: Personal Remembrances of an Era, 1912 to 1954. Hattiesburg, MS: University of Southern Mississippi Press. ^ "University of Southern Mississippi Foundation Endowment Fund". Endowments.com. June 30, 2014. Retrieved June 23, 2016. ^ a b Office of Institutional Research. "USM Fact Book 2017–2018" (PDF). Fact Book 2017–2018. University of Southern Mississippi. Retrieved June 23, 2018. ^ "University of Southern Mississippi at Hattiesburg, Mississippi". EduMaritime.com. Retrieved May 29, 2015. ^ "School of Polymers and High Performance Materials – The University of Southern Mississippi". Retrieved May 29, 2015. ^ "Best Colleges". University of Southern Mississippi Overall Rankings. U.S. News & World Report. Retrieved June 23, 2018. ^ "About Southern Miss". About. University of Southern Mississippi. Retrieved June 23, 2018. ^ a b Morgan, Chester (1987). The University of Southern Mississippi:1912–1987. Jackson and London: The University Press of Mississippi. p. 3. ISBN 0-87805-307-7. ^ Morgan, Chester (1987). 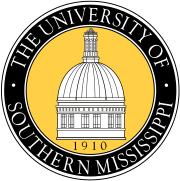 The University of Southern Mississippi:1912–1987. Jackson and London: The University Press of Mississippi. p. 3. ISBN 0-87805-307-7. ^ a b c Brown, Jennie (1994). Medgar Evers. Holloway House. pp. 128–132. ISBN 978-0-8706-7594-2. ^ a b Tucker, William H. The Funding of Scientific Racism: Wickliffe Draper and the Pioneer Fund, University of Illinois Press (May 30, 2007), pp 165-66. ^ a b "Sons of Confederate Veterans in its own Civil War". Retrieved May 29, 2015. ^ "Spring Commencement Ceremony Features Special Honor for Clyde Kennard". Southern Miss Now. University of Southern Mississippi. Retrieved May 14, 2018. ^ "University of Southern Mississippi to award posthumous degree to Clyde Kennard". Hattiesburg American. Retrieved May 14, 2018. ^ Bristol, Douglas; Ross, Andrew. "Hunting Homosexuals at Southern Miss: 1955–1965; Analyzing the Journals of William D. McCain". OutHistory.org. Retrieved March 6, 2018. ^ "African American Student Organization Reunion set for August 30 – Sept. 1 | Southern Miss Now". news.usm.edu. Retrieved March 6, 2018. ^ "University of Southern Mississippi Position on Current State Flag Debate | Southern Miss Now". news.usm.edu. Retrieved March 6, 2018. ^ "Message from University President Rodney D. Bennett on Removal of State Flag | Southern Miss Now". news.usm.edu. Retrieved March 6, 2018. ^ "USPTO TTABVUE. Proceeding Number 91164745". Ttabvue.uspto.gov. Retrieved June 23, 2016. ^ Miller, Mark J. (August 3, 2011). "Logo Showdown: Iowa Hawkeyes Clips Southern Miss Golden Eagle". brandchannel. Retrieved June 23, 2016. ^ "College Logo Showdown: Hawkeye vs. Golden Eagle – David Lizerbram & Associates". Lizerbramlaw.com. Retrieved June 23, 2016. ^ "It is official, Southern Miss has a new logo". Underdog Dynasty. Retrieved June 23, 2016. ^ "Army Will Close 13 ROTC Programs". Inside Higher Ed. Washington, D.C. October 3, 2013. Retrieved February 6, 2014. ^ "USM to appeal Arm'ys decision to close it's ROTC program". Jackson, Mississippi: WLBT 3 – Fox 40. October 4, 2013. Retrieved February 6, 2014. ^ Kemp, Ed (October 13, 2013). "USM Army ROTC not alone in falling short: Alcorn, JSU-MSVU also below required number". Hattiesburg American. Archived from the original on February 6, 2014. Retrieved February 6, 2014. ^ Coll, Jim (November 6, 2013). "U.S. Army Delays Closure of Southern Miss ROTC Program". Southern Miss Now. Hattiesburg, Mississippi. Retrieved February 6, 2014. ^ The University of Southern Mississippi (2006). Southern Miss Profile Archived March 7, 2012, at the Wayback Machine. ^ "Arts Institute of Mississippi | The University of Southern Mississippi". www.usm.edu. Retrieved March 6, 2018. ^ "Richard McCarthy Lecture Series | The University of Southern Mississippi". www.usm.edu. Retrieved March 6, 2018. ^ "USM draft reorganization plan reduces colleges, defines administrative roles". Hattiesburg American. Retrieved March 6, 2018. ^ "Academic Reorganization Planning". Office of the Provost. University of Southern Mississippi. Retrieved July 3, 2018. ^ "Gulf Park College for Women". Retrieved May 29, 2015. ^ "The University of Southern Mississippi". Retrieved May 29, 2015. ^ "The University of Southern Mississippi – Visitors". Retrieved July 7, 2014. ^ "Flower growers depend on roses (04-01-2002)". Retrieved May 29, 2015. ^ "Office of University Communications – The University of Southern Mississippi". Retrieved May 29, 2015. ^ Van Arnold (October 25, 2013). "Southern Miss Dedicates Massive Golden Eagle Statues on Campuses | Southern Miss Now". Usm.edu. Retrieved June 23, 2016. ^ "Office of Greek Life: Calendar & Fast Facts". USM.edu. 2017. ^ "Southern Miss Now. Your news, your university". The University of Southern Mississippi. Retrieved April 27, 2016. ^ "The Talon". Southern Miss Alumni Association. Retrieved April 27, 2016. ^ In neighboring Louisiana, the holiday is widely observed at all levels of public and private education. ^ "Southern Miss Football :: Official Athletic Site". www.southernmiss.com. Archived from the original on March 7, 2018. Retrieved March 6, 2018. ^ Group, Sinclair Broadcast. "Greatest Moments | Southern Miss spoiled Bear Bryant's final home game". ASN. Retrieved March 6, 2018. ^ "Southern Miss Facilities :: Official Athletic Site". www.southernmiss.com. Retrieved March 6, 2018. ^ "About Symphony Orchestra". Retrieved May 29, 2015.